On the face of it, BBC’s Sherlock is a detective drama. For one, the main character is the most famous detective of all time, Sherlock Holmes. For two, he spends every episode solving mysteries. For three, the crime-solution-capture arc resembles every other detective show in history. The evidence, har har, is overwhelming. Still, a Sherlock viewer would be remiss if he or she didn’t occasionally step back to view the show through the lens of comedy. How else can you describe 90 minutes of television that places Benedict Cumberbatch’s Holmes, a self-described “high-functioning sociopath,” at a wedding where he’s being forced to give the best man’s speech for his friend, John Watson (Martin Freeman)? A key tenet of many comedies is the placement of bizarre personalities into unfamiliar situations, and “The Sign of Three” executed this classic technique flawlessly. And this is just the latest in the show’s history of successful punch lines. With Sherlock, the case matters, but so does the humor. The wedding speech itself was masterfully wrought, hilarious and tear-jerking almost at once, and Sherlock managed to connect with his remote grasp of human emotions just enough to avoid making a spectacle of himself. At first, anyway. But it soon becomes evident that two unsolved cases—one involving a man posing as a series of recently deceased Londoners and going out on one-night-only dinners, thereby convincing the women that they’ve dated a ghost, the other a mysterious stabbing of a guardsman that seems to have occurred without a weapon in a locked room with no access—bear some strange relation to John’s wedding. Sherlock’s speech soon goes off the rails as he paces between the guests, trying to determine the potential victim and the modus operandi of the criminal, when it hits him: The only person who would be targeted at a wedding is a person who can only be targeted at a wedding. The only possible target is a former army commander of John’s who led new recruits into battle in Afghanistan and emerged as the only survivor. He’s been the recipient of death threats ever since. As it turns out, a brother of one of his dead soldiers is the “Mayfly Man” going on the ghost-dates—the women have all seen the wedding invitation as servants of potential guests, and have given him the access he needs. His plan is to stab the commander through the belt with a sharp pin in a way that’s goes unnoticed. The belt will hold the wound together until the moment it’s removed, at which point it will bleed openly and lead to death. The guardsman was his test run, and only John’s quick intervention saved that life. After some drama, in which the commander nearly removes the belt behind a locked door and ends his life, he’s saved, and Lestrade catches the culprit, who was posing as the only person you’ll seldom if ever find a picture of in a wedding album. So there’s your plot, and there’s your detective story. In the midst of this, though, the comedy plays out grandly, with Sherlock using the second half of his speech to reference strange cases like “the poison giant” (a cut shows us a dwarf with a blowgun on a roof), “the hollow client” (an empty suit in a chair), “the elephant in the room” (it involves a real elephant), and one about a French decathlete who died surrounded by thousands of empty matchboxes. This whimsy, which is like a Wes Anderson montage on speed, hits its mark. As does Sherlock’s confession that he loves dancing, and his obsessive wedding planning, which includes folding napkins into likenesses of the Sydney opera house. As does the drunk adventure he and Watson undertake on his “stag night,” which ends with Sherlock puking on the carpet of a room he’s supposed to be investigating for clues. As does Sherlock’s grilling of John and Mary’s (Freeman’s real-life wife, Amanda Abbington) friends, and downgrading some of them to “casual acquaintances” based on factors like their rate of Twitter replies. It’s all gold, but creators Steven Moffat and Mark Gatiss manage to imbue the show with heart, and end on a melancholy note. 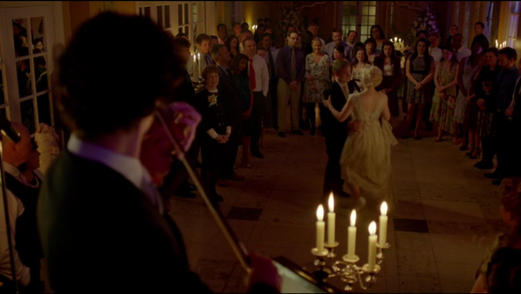 After composing a waltz and playing it for John and Mary’s first dance as a couple, Sherlock watches the maid of honor find her beau for the night (he helped), and while everyone else dances, he can only watch, outside the party. This is the sacrifice of being Sherlock; you can’t be arrogant and brilliant and calculating and still be one of the people. He can love dancing, but he can never do it in public. This feeds into his insecurity that John won’t have time for him now that he’s married, and with a note of regret, he leaves the wedding party, throws on his sweeping black coat, and heads alone into the London night.